MacKenzie and Margo Beaulieu, and Jacob Milton, all of Caribou, help HHPR with sorting and dividing the food. Note: THIS PROGRAM IS CLOSED DUE TO FOOD SHORTAGES. The Halfway Home Pet Rescue Free Pet Food Pantry is dedicated to the memory of Marie Joyce Allen. Marie dedicated her life to helping others and was especially dedicated to helping homeless animals. It is through the kindness of people like Marie Joyce Allen that Halfway Home Pet Rescue is able to continue helping homeless, helpless animals. The pet food pantry is possible through the coordinated generosity of our volunteers. Product Recovery in Portland gives us donated food each month. 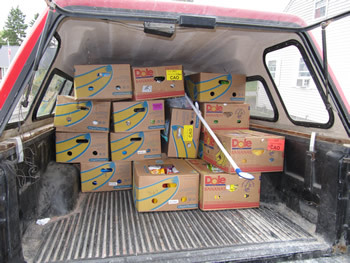 A volunteer in Etna, Maine travels to Portland to pick up the supplies and then 2 other volunteers meet him in Sherman, Maine to transfer the load and transport it to volunteers who sort and package for shelter animals and food pantry. The food truck arrived full and volunteers immediately began unloading.